Read Part 5 – Why Tiger’s Nest Bhutan Blew Our Mind? Read Part 6 – Bhutan Blunders: Things that Went Terribly Wrong With the Trip! We would never have thought that our road trip to Bhutan would be so full of surprises. In fact, when we were just planning the logistics, we weren’t too excited. With the limited number of flights headed to the tiny little country to the government-controlled tourist industry, everything seemed like an unforeseen disappointment. As it turned out, upon reaching Thimphu, none of this mattered. We had a wonderful time during our travel to Bhutan and took back some precious memories. What we were especially excited about was attending the religious festivals. From what we knew, several huge religious festivals are celebrated with much gusto at different points in time during the year. I had hoped my trip would coincide with one of these and am glad that my wish was granted! As is obvious, my Bhutanese adventure was everything we wanted and more! How to Travel to Bhutan From India? It was a pleasure to sample a wide gamut of experiences in Bhutan as we were there for almost a week, which we think is ideal to explore Thimphu and Paro. It would be best to stay in Thimphu, the capital city, for 2-3 days and spending the remaining days in Paro and Punakha. Explore the virgin forests, little villages, and the gorgeous monasteries in the entire world. Day 4 – Explore the remaining attractions of the city. Visit Dochula Pass. Day 5 – Drive down to Paro and uncover all the attractions. Eat at the cutesy cafes and explore the monasteries. Day 6 – Hike the Paro Taktsang or Tiger’s nest. In the evening head back to Jaigaon. The ones traveling from anywhere other than India, the same itinerary applies, just the day 1 and day 7 would mean flying directly to Paro and returning from Paro in DrukAir. We’d love for you to know about the things we loved the most about the country – the ones you shouldn’t miss doing during your travel to Bhutan. Drives and hikes around Paro, especially Taktsang (Tiger’s Nest) and Dochula Pass. Their coffee! I simply loved the fact that it was easier to find great coffee at a lot of places all around Bhutan. Gates marking the borders between Bhutan and various other places, particularly the entrance to Thimphu and Paro. Being treated to tea and snacks inside a monk’s room in the monastery. Truly being treated like a local. People in Bhutan definitely take the adage ‘Guest is God’ to their hearts. Attending Paro and Thimphu festivals amidst huge fanfare. Eating at cutesy cafes all around and tasting the local Bhutanese delicacies. Planning a road trip to Bhutan is a superb alternative for those who wish to save the otherwise high airfare charges that can dent the pocket. Well, here’s how to travel to Bhutan for those who wish to fly directly. You can opt to fly in Druk Air which can take the cost of the trip to an unprecedented high. But those who enjoy long drives and scenic beauty (just like us) should definitely take the drive from Bagdogra to Jaigaon or Phuensholing (in the south is the gateway to Bhutan). If taking the road trip route like us, write this day off as the long drive is going to leave you extremely tired. It is advisable to get sound sleep before starting your road trip in Bhutan the next day. Here are some things that you should keep in mind on reaching Bagdogra. Once you’ll exit the airport, you can find a lot of taxi drivers waiting to take you to Jaigaon. It’s about 4-hour journey from there and the charge is 2500INR. A basic car would be okay for the drive as the road condition is great. There’s a big supermarket at Jaigaon where you can stock up on snacks and other necessary stuff for your road trip. Stay: We reached Jaigaon at odd hours (10:30 pm), so we took accommodation in a budget hotel over there – Kasturi In (1500INR per night). The rooms were decent and even the food was not bad. After taking the permit from the Regional Transport Office in Phuensholing, start straightaway for Thimphu. Pick up a car at the Phuensholing (we had already booked ours through a friend who had visited Bhutan some time back) and get ready for a spectacular drive of your life. Cascading waterfalls, gorgeous bridges, highways laden with greenery, soaring cliffs and striking blue skies blend together for picture-perfect frames. This day, you drive to Bhutan’s capital (Thimphu). Your first experience on the Bhutan highway is definitely going to be an interesting one. The twisting and twirling roads will take you into the mountains whilst giving you spectacular views of Phuensholing and plains bordering the region. You’ll notice the scenery and plantation changing with each turn. Thimphu city is about 4 hours away from Phuensholing and its wild beauty enchants. Bhutan’s capital, also the most modern city, is an intriguing destination in the world. Retaining the small-world feel, the city is slowly becoming commercialized, with numerous internet cafes, restaurants, and nightclubs. Enroute Thimphu, after about 2 hours from Phuensholing is a small cafe namely Sonam Hotel where you are sure to find yourself stopping for a quick meal. You have to get your permit checked at two places. Keep that in mind else you may have to go back all the way to get it checked. Stay: Drolema Residence – a neat and well-managed hotel located in the city center. Per night cost for staying in this hotel is 2000INR. Prayer flags adorn the entire country – just beautiful to look at. Uncover all attractions of Thimphu during the day and enjoy the market scene in the evening. A picturesque drive through impressive paddy fields and pastures will make your drive memorable. The Memorial Stupa, also called Thimphu Chorten is about 15 minutes drive from the city center. This whitewashed Tibetian-style chorten features stunning mandalas, statues, and a small shrine. Entry to this chorten is free. Parking is chargeable. From there, head to the Buddha Point from where the panoramic view of Thimphu city can be seen. The Golden Buddha Doredenma is perched on the top of the mountain that is 2000m above sea level. Click as many pictures as you may want to and enjoy the peace of the country from this stunning point. Another important attraction that you can include in your itinerary on this day is Changlimithang Stadium. Sports lovers will find it worth their time to watch practice sessions of archery at the stadium, as did we. Harsh even tried his hands at the game, must add, the first attempt went pretty well. There’s a small playground in front of the archery stadium, where we spent some time looking at the way Bhutanese people enjoy their lives and spend their days. How we wish we could live the way they do! Ah! I was spellbound. Thimphu city itself is the focal point of all activity: the streets are lined with cafes and lovely restaurants. We spent our night lazing and walking on the streets of the city, relishing a languorous dinner in the town (often heading to Hunger Strike for quick meals), while listening to great music, and devouring many cups of nicely made coffee. Best part, we also managed to get a taste of Bhutanese nightlife, which is slowly developing. We were advised not to expect much as in India, the night parties are crazy and they wouldn’t match our taste. But obviously, we had to see it for ourselves. Early morning we decided to go to the Dochula Pass ( a half hour drive from Thimphu City) and thankfully we had arranged for our permit the day we arrived in Thimphu (the immigration office remains closed on weekends and during festivities). It was a quick drive from the city, and definitely worth it! This mountain pass on the way to Punakha assures a stunning 360-degree view of Himalayan mountain range. The pass that is adorned with 108 shortens was commissioned by the eldest Queen Mother, Her Majesty Ashi Dorji Wangmo Wangchuk. It is best to leave early morning as then you’ll have the rest of the day for sightseeing during Bhutan travel. We came back to Thimphu city to be a part of the cultural festival that took place at TashichhoDzong – a gorgeous monastery built on traditional lines. We spent most of our time there, enjoying the colorful celebrations, amidst a big fanfare. Usually, there is no entry fee, but for the festival, we paid 500INR for couple entry (perhaps the entry fee was just for foreigners). Here, we got the chance to see some of the most amazing dances of the Himalayan region. The colors, vigor, and drama have surely become a part of our vivid memory. You can read more about our experience of being a part of Bhutanese Festivals, here. Come back and enjoy the local market scene. If you still have time you can visit other Chagri Dorjeden – a Buddhist monastery built in the 16th century by 1st Zhabdrung Rinpoche. So it’s time to leave Thimphu and explore the next city, Paro. Take to the road again and start exploring the striking valley. Fortunately, there are many free things to be enjoyed in Paro. It’s about 90 minutes drive from Thimphu city, and the drive is simply serene and scenic. Stop by the Paro Airport and take a few pictures as the bird’s eye view of this place is absolutely wonderful. Sadly we couldn’t stay there for long to see an airplane take off or land. Spend rest of the day walking around the Paro market. We had our lunch at the Champaca cafe and went straight to the hotel. From there, you can go to explore The National Museum of Bhutan and Kyichu Lhakhang. Kyichu Lhakhang is the oldest temple of Bhutan and you can find elderly pilgrims spinning the prayer wheels constantly. It’s sure a sight to behold during Bhutan travel! If you are not tired, you can visit a few handicraft stores in the market and splurge on some nice souvenirs to take back home. Stay: We slept at the Rema Resort and had fun clicking some nice pictures from there. You can read more about our stay at the resort during travel to Bhutan, here. This was a long day not because we had a lot to do, but due to some unforeseen circumstances, that put us in a fix. Paro Taktsang trek has to be the most difficult trek of my life as though we enjoyed trekking uphill a lot but getting down was hell crazy. It began to rain when we were getting down and trekking down the steep valley was a major challenge for us – so much that I slipped twice. In fact, a lot of visitors had to face the same plight and this gave us a good lesson that we should always carry good hiking and rain gear no matter how good the weather condition is. You just cannot be sure about anything! Even though we took longer time hiking downhill still it took us about 5 hours to complete the entire Tiger’s Nest trek. So we got back from the trek and were taken to a nice cafe namely ‘My Kind of Place’ where we changed our clothes and had good coffee (was much needed). After stretching our legs for a while, we made our way back to Phuensholing. The drive was way more scenic with all the cotton candy clouds now adorning the mountain passes. We were totally spellbound by the jaw-dropping 360° views of Bhutan. Again spend the night in Phuensholing. Tip: Wear sturdy hiking shoes and carry your rain gear. I am running out of superlatives to describe my trip to Bhutan! The country delivered more than what I had expected of it. Truly The Drive Of Our Lives…. There is something to be said about the natural beauty that Bhutanese land is home to. Nestling in the Himalayas, virtually every nook and corner boasts of valley views and picturesque mountainsides. It had already been decided that this is going to be an adventure-filled trip and thus, plans for trekking, biking and hiking were already in place. The surprise was that the virgin forests of Bhutan were supposedly full of exotic wildlife which we could get a glimpse of at numerous sanctuaries and wildlife parks. But nothing was as fascinating as the unique cultural ethos of Bhutan. We knew that it is a predominantly Buddhist society but the serenity and sense of peace that envelops the general way of life here was something we weren’t expecting. Attending a Buddhist festival further opened our eyes to the wealth of traditions this Himalayan kingdom is home to. The local population preserves their native legacy of kind hospitality till this day and interacting with the English-speaking people there was an absolute pleasure. You can easily find cars for rent from India-Bhutan border so you can choose to travel in any country’s taxi. If you plan on taking a taxi on rent from India to Bhutan then you’ll have to take a permit (which costs 2,500 INR/38USD). It’s better to hire a local Bhutanese driver who can pick you up from the border. If you want to travel to Punakha, get your permit before the weekend as the immigration office remains closed during weekends. Even during the festivals, the office doesn’t operate. Almost all goods are imported in Bhutan from India and China. This is the reason why supermarkets can get really expensive here. You will love to stop your car every 15 minutes as the views are extremely scenic. So you can explore this gorgeous country at your own pace. Booking accommodation in advance is a good idea. Though we booked it later – on arriving in Thimphu – and surprisingly the rates were lower and well within our budget. It’ll be best to ask about price before availing any service as otherwise, you can end up paying way more than the usual price. There you have your sought-after itinerary for the road trips in Bhutan. Sarah has had the pleasure of visiting, but Bhutan still remains high on my bucket list! From what I’ve seen here and heard from her, that desire remains strong. After all, what’s not to love about a country that removes its only set of traffic lights and replaces them with a traffic warden, because the lights were too “unfriendly”! What a gorgeous, colorful land to explore! You’ve definitely inspired me to visit with this post. Thanks for the tips! Already bookmarked! Bhutan is high on our bucket list and your itinerary is going to help us a lot. Really like the way you have put in all the details day by day. Bhutan looks even more vibrant and beautiful than we imagined. We would especially love to visit Paro Takstang Monastery. Do they allow visitors? The virgin beauty of Bhutan is so very shy – but it is mesmerizing to be able to explore it. Yes, Paro Monastery allows visitors. I’d be sharing Part 2 and Part 3 of planning the trip and visit to Paro Monastery soon. Wow I just wrote a blog post where I had Bhutan on my bucket list. Haven’t read many blog posts about it and I will definitely bookmark yours for reference when I plan my trip there. The pictures look amazing! Lovely itinerary! Us Indians are so lucky we have free access to Bhutan. I so want to go to Bhutan and hopefully 2017 opens up some doors for me. Great pictures! I think 7 days is perfect for this visit too. Loved all the places you guys had visited, all so colourful and looks peaceful. The food looks great too! Can’t wait to make another trip to Bhutan myself, thanks for sharing and bringing back memories! 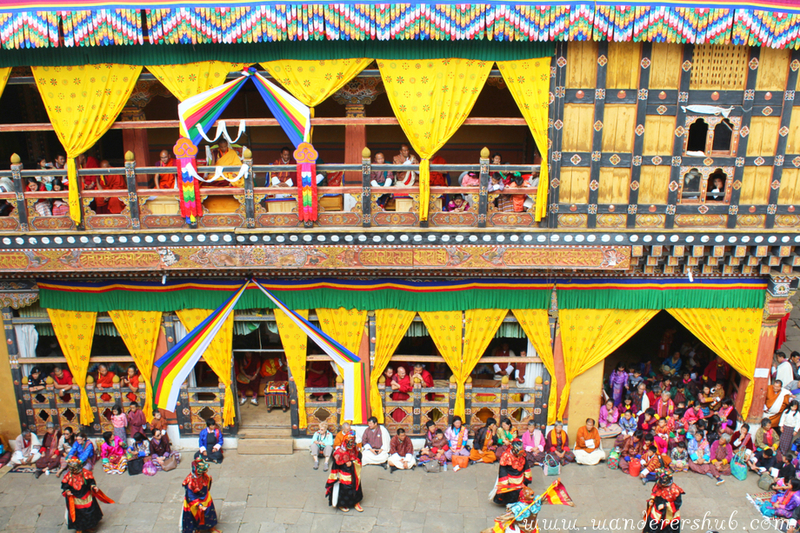 Bhutan comes alive in all its vivid colours and charm in your post. It is such a lovely place, no wonder it has a GHP rather than a GDP. Would love to visit Bhutan someday. Thought about it when we were in Sikkim. This is excellent. I love that you provided so many tips and details. You included everything that people would want to know before making travel plans! Wow this looks like such an incredible trip. I would love to visit. Wow, nice photos!!! Bhutan is gorgeous! Haven’t come across bloggers who have written about Bhutan. I hope to make it out there some day. Thanks for sharing! What an excellent trip itinerary! I hadn’t really thought much to Bhutan before reading your post, but the scenery and architecture looks so beautiful – even the border gate is so enchanting! And the hike looks incredible, what a rewarding experience. Gorgeous photos too, I love the ones of the prayer flags. It looks so colourful and fabulous! And that monastery on the cliff edge looks amazing – but so inspiring! And I love a place that knows what good coffee is all about. Bhutan looks like it has a bit of something for everyone! Would love to hike like you did! I believe you guys had an awesome trip to Bhutan! It’s a perfect timing going there that you get to experience the festival just in time. Also, the Taro Pakstang monastery, whoah, I have seen an image similar to it somewhere here online and glad you take a pic of it! I am pretty sure that it is quite scary to climb up there but sure it is worth it at the same time as well! I dropped a mail to you. Could you pls help me with the details. Wow! Amazing trip! The itinerary is jam packed with goodies. If I only did half of what you did, I’d have the time of my life! Thank you for sharing your experiences and giving us your tips for making the trip a spectacular one. I have to admit that I know very little about Bhutan. I do love a good road trip, so if I ever find myself in that part of the world, I know where to look now! I think being able to see the Golden Buddha Doredenma in real life would be a very humbling experience. I’ve seen pictures of the Paro Takstang Monastery and would love the chance to see it! Well-researched, beautifully illustrated. Sure you’re not working for the Bhutan Tourist Office? Paro looks like a cute airport, definitely a step away from the bland international style buildings seen just about everywhere else. And yes, I’m always up for a roadtrip. Especially through interesting scenery. Great excuse to stock up on junk food and pause at roadside cafes. I’ve always wanted to visit Bhutan ever since I saw a documentary on their Gross Domestic Happiness philosophy. Not only your guide really thorough and well researched, the video at the end is a great addition! You’ve motivated me to make my Bhutan trip happen, thank you for sharing! Great coffee and beautiful hikes?? Sounds like I definitely need to add Bhutan to my list! Ahh, I love road trips! I am always up for a good road trip! You get to see and experience so much more. Bhutan looks gorgeous, you got me at coffee haha Beautiful scenery, great narrating! That was indeed an epic road trip in more senses than one. Traveling on the roads of Bhutan must indeed have been an amazing experience and your pictures and words sing paeans of the beauty of the land. A couple of years ago we were in Sikkim and the driver showed us a road, which he said lead to Bhutan. We heaved a sigh and thought next time! Hope to get there soon. What a great trip! I don’t think we are as adventurous as you are, but it’s nice to live vicariously. Read and heard much about the happy country Bhutan. You have shared this post with some very interesting pictures to help my imagination. I must say you have considered every query that may come in the minds of readers who consider a Bhutan trip. A very interesting and informative blog!